Buckets of Rice Abound: China Expert Gets It Wrong at a Chinese Restaurant in the U.S.
One of the diners, who had lived in Beijing for much of the 2000s, was surprised [when a server brought out a family-style bowl of rice] and made a comment to the server, saying "'Oh, you guys don't serve them in individual rice bowls? '," related another diner in the party, who asked to go by his first name, Matt. Read the rest of story for the sarcasm and insults which followed and the resulting fallout. I will just focus on the claim made by Matt's friend. Had I had been there, I would have felt compelled to respond. 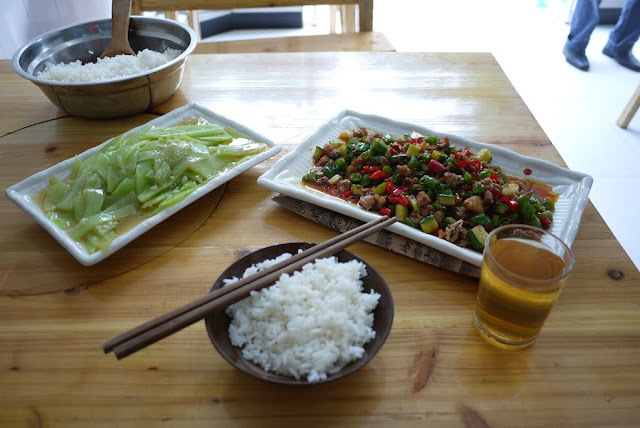 But before sharing what I would have said, I would like to take a slight detour and introduce a wonderful, spicy chicken dish (茶油鸡) I enjoyed in Hengyang, Hunan. Looks delicious, right? It was. But what I really want to highlight is in another picture I hadn't expected to ever share here. It shows the dish in a more-consumed state. The photo also includes a family-sized portion of rice served in a shiny metal bucket. I wasn't surprised by it at all. And I didn't question the waitress about it. How the rice was served at a nearby trendier restaurant did surprise me though. It is hard to see in the above photo, so I will share a cropped version. At this restaurant, you can have your family-sized portion of rice served in a rice cooker which sat on your table. In my experience, this is rather unusual. 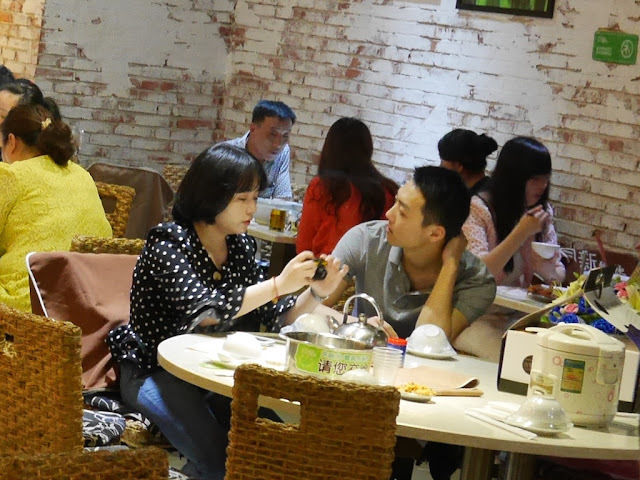 But what isn't unusual in Hengyang is restaurants serving family-sized portions of rice for diners to share. In fact, it is quite common. 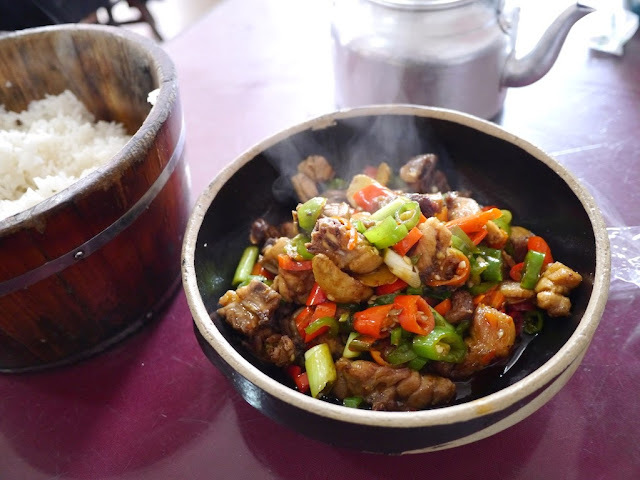 Part of a rice bucket can be seen in this photo of a tasty chicken dish at another restaurant in Hengyang. 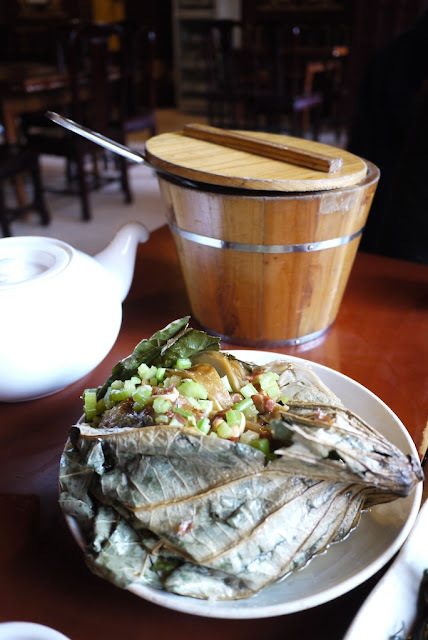 And at yet another restaurant, one can be seen in this photo of my favorite eel dish in Hengyang. Are family-sized portions of rice just a Hengyang thing? Nope, it is common elsewhere in Hunan province too. 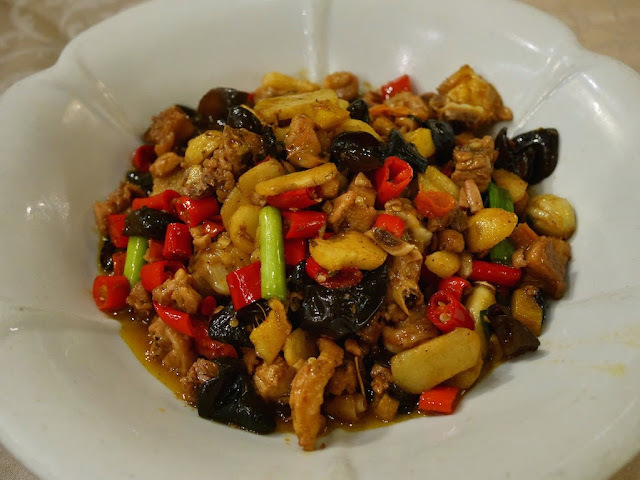 For example, here is a photo of a spicy chicken dish (earlier shared here) I enjoyed several times at a restaurant in Hunan's capital, Changsha. In this case, a lovely wooden bucket was used. They are common as well. Please don't complain to your server about these. Wooden buckets of rice are the best. So are family-sized portions of rice just a Hunan thing? Again, no. 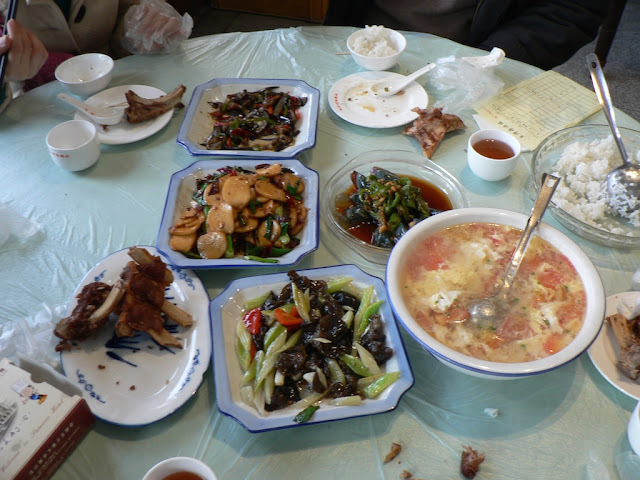 Here is a part of a meal I enjoyed over nine years ago in Wuhan, Hubei. In this case, a big glass bowl for the family-sized portion of rice worked just fine. But the glory of wooden buckets shouldn't be forgotten, so here is one with a lot of rice at an incredible vegetarian restaurant in Guiyang, Guizhou. At another restaurant in Guiyang, this one with meat on the menu, a big metal bowl sufficed for the family-sized portion of rice. But Peter Chang isn't famed for serving the local-style food found in Hunan, Hubei, and Guizhou. 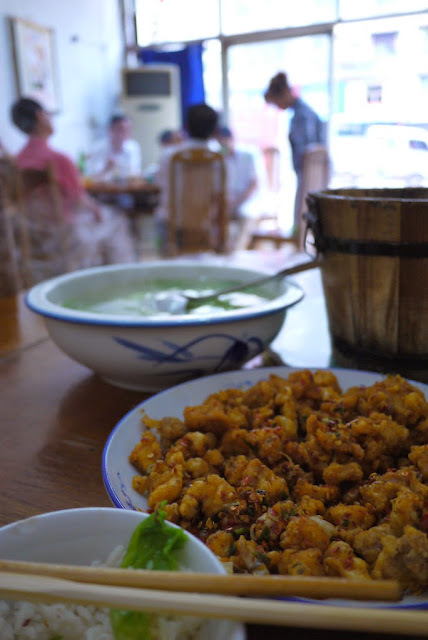 Instead, it is described as an "authentic Sichuan outpost". I happen to be a big fan of Sichuan-style (Szechuanese) food. 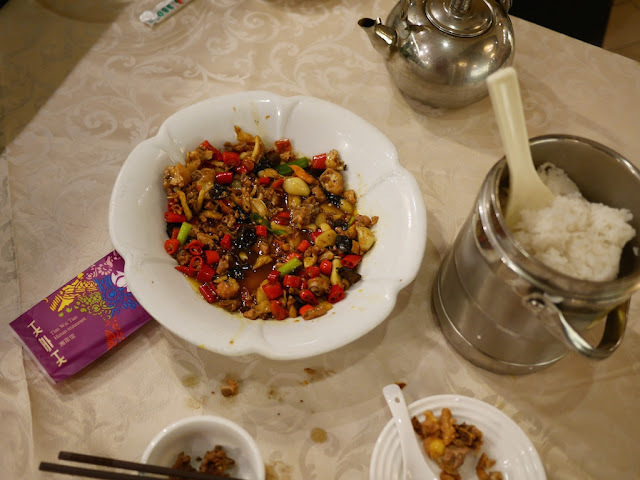 On that note, here is a rabbit dish I ate in Zigong, Sichuan. Now that is a stunning wooden bucket (with rice). 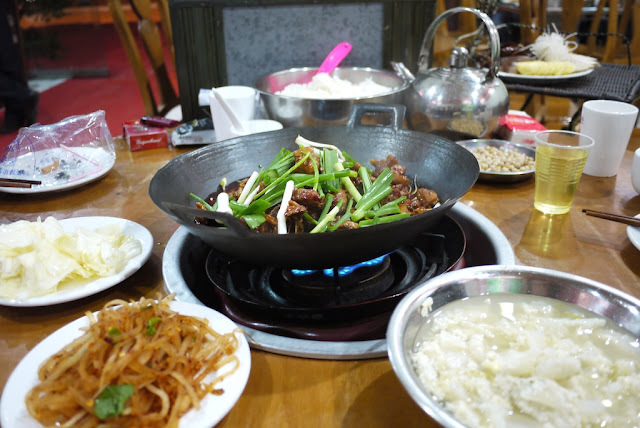 Here is another rabbit dish I ate in Zigong. 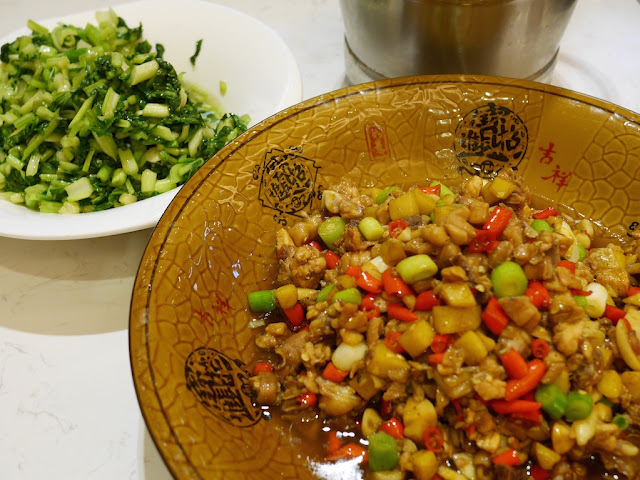 Both of these meals in Zigong came with family-sized portions of rice. Like rabbit meat, this is common there. 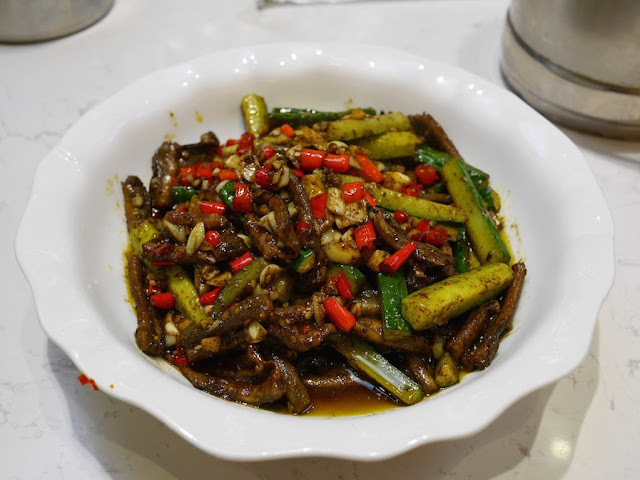 I am not familiar with the details of Peter Chang's menu, but many Sichuan restaurants outside of Sichuan province base their menu on the style of food found in its capital Chengdu. 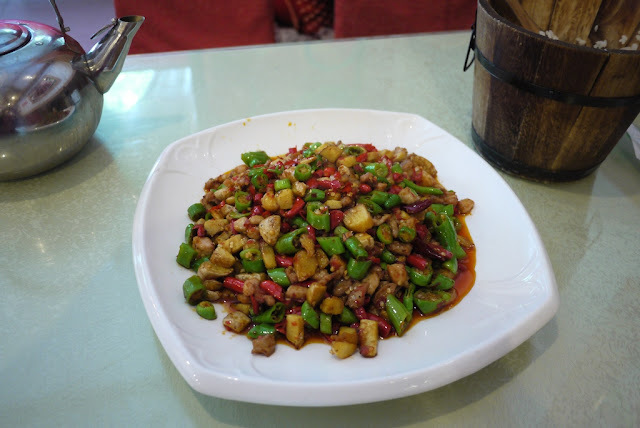 So here is a dish I enjoyed during my most recent visit to Chengdu. I am not sure whether this is a rabbit or a chicken dish, but there was definitely plenty of rice in that beautiful wooden bucket. Undoubtedly, many places in China serve "personalized bowls" of rice. In my experience, region is one key factor affecting the likelihood of receiving a family-sized portion of rice at a restaurant in China. Other factors matter as well. 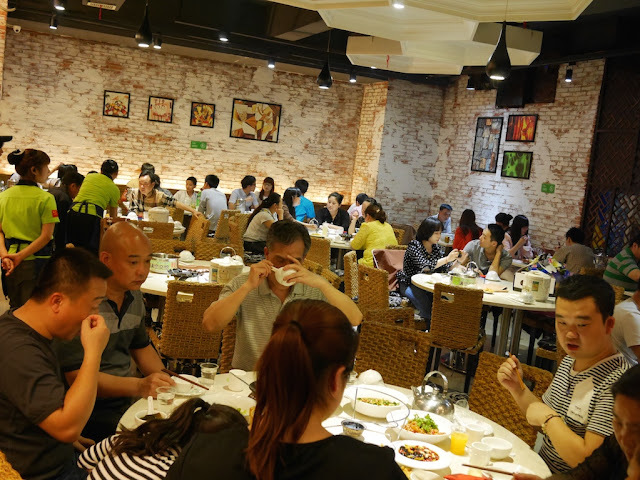 Even in a city such as Hengyang where family-sized portions of rice are especially common, single servings in small bowls are typical in some environments — for example, cafeteria-style restaurants. I don't know the percentage of restaurants in China which serve family-sized portions of rice, and a guess wouldn't be very meaningful. But I am confident it is significant number. I don't take photos of every meal I eat, when I do photograph a meal I rarely capture how the rice is served, and in preparing this post I only searched through a small percentage of my photos for relevant examples. In other words, these photos represent just a tiny portion of the many times in China I have been served a family-sized portion of rice. This is all the more remarkable, since in a majority of the above examples I was eating alone and would sometimes point out I only needed a small bowl of rice. But the bucket or big bowl of rice would still come. So if I had been at that table in Virginia, I would have asked Matt's friend what in the world he was talking about and pointed out that serving family-sized portions of rice is certainly another "way it's done in China", particularly in a place such as Sichuan. I would be curious to learn about his own experience in China to better understand how he came to his conclusion. Perhaps we would discuss how China's "different colors" trip up even the people who may know it best. And hopefully it would have been possible at some point for me to say "pass that authentic and awesome wooden bucket of rice".